Hamilton and Daniell have creatively taught us how to weave together the threads of lineage that create family legacy. They have also clarified the vision of what family leaders look like who are the master weavers of such threads. This all leads toward teaching us how to create and guide our families, and those we serve, to seven and more generations of successful, generative and flourishing lives as individuals and as family. We owe their work a deep debt of gratitude and a bow of appreciation. James (Jay) E. Hughes, Jr.
Mark Daniell and Sara Hamilton have written a book that will become a real reference for families wishing to establish a long–term strategy for building an enduring legacy for generations. It contains a wealth of ideas, strategy prescriptions, case histories, and anecdotes that will give the family leader and members of the tribe a true guide to building a system that will endure the test of time. I recommend it to families in Asia and beyond. This is a superb book unique and full of examples on the vision of legacy and the role of family leadership. It is also a comprehensive guide to risk management with a special spirit for wise risk–taking. Daniell and Hamilton draw on the unique experience of the Family Office Exchange and its many hundreds of members and scores of studies to define the role of family leadership more fully and inspiringly than ever. 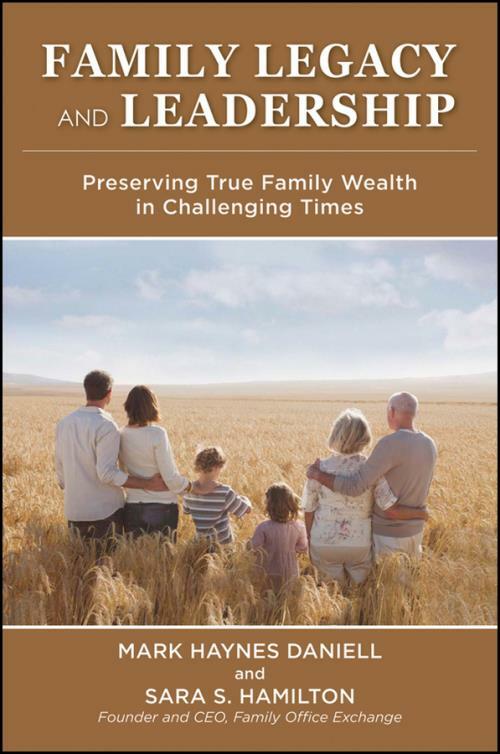 This book makes the challenges vivid and the path clear for successful families to preserve both their wealth and their purpose. Family Legacy and Leadership is an innovative, useful blend of theory and practice; and of the hard and soft issues that families face. It offers ideas, insights, and tools that will help families of all types find their path through change. Part I: Family Legacy and Legacy Planning. 1. Building an Enduring Legacy. 2. Defi ning a Clear Philosophy of Family Wealth. 3. The Family Promise, the Constitution, and Responsible Ownership. 4. Preparing Children for the Responsibilities of Wealth. 5. Philanthropy as a Cornerstone of Legacy. 6. A Practical Framework for Legacy Planning. Part II: Family Leadership and Succession. 7. Leadership Challenges in the Family Enterprise. 8. Proven Approaches to Family Leadership. 9. Leadership Skills for the Twenty–First Century. Part III: The Management of Risk and Change. 12. Managing Risks to Wealth and Wellbeing. 13. Designing a Family Eco–system Worthy of Trust. 14. Mastering New Challenges to Financial Wealth. 15. Structuring the Family Office as Manager of Risk and Change. 16. Creating an Entrepreneurial Culture in the Family. A Profile of Family Office Exchange. B Operating Frameworks for Legacy, Leadership,and Risk Management. C Strategies for Creating an Entrepreneurial Culture.